Key Takeaway: The U.S. is proceeding with an emergent strategy to retake ar-Raqqah City from ISIS. The composition of forces and the contours of future operations to clear ISIS from the city remain undecided, despite ongoing operations by the Syrian Democratic Forces (SDF) to isolate the city. Both Turkey and the SDF continue to apply pressure on the U.S.-led coalition to exclude the other in any future capture and governance of ar-Raqqah City. The U.S. nonetheless moved forward with operations to isolate the city in early November to apply dual pressure to ISIS amidst an ongoing campaign to seize Mosul from ISIS in Iraq. The SDF launched the first phase of “Operation Euphrates Wrath” on November 5 with the aim of isolating the ISIS-held city of ar-Raqqah from the north. The SDF advanced over 15 KM south along two axes towards ar-Raqqah City with support from U.S.-led coalition airstrikes from November 5 - 19. Phase one ended after the SDF seized the village of Tel Saman on November 19, positioning the SDF at the entrance to the river valley encircling ar-Raqqah City from the north. ISIS only deployed a moderate mobile defense against the SDF in the northern ar-Raqqah countryside, allowing the SDF steady progress during the first phase of the operation. The SDF launched phase two of Operation Euphrates Wrath on December 10 with the aim of isolating the western axis of ar-Raqqah City after a two-week operational reset. The start of the operation coincided with the deployment of an additional 200 U.S. Special Operations Forces to support the SDF. The SDF advanced southeast from its areas of control in the vicinity of the Tishreen Dam along the eastern bank of the Euphrates River, seizing over 130 villages and advancing over 40 KM as of January 12. The advance positions the SDF within 5 KM of the Tabqah Dam, the next target for the SDF. The Tabqah Dam, located west of ar-Raqqah City, is the largest dam in Syria and a likely command-and-control node for ISIS that reportedly houses senior leadership, an arms depot, and high value prisoners. The YPG remains the force best positioned to seize the Tabqah Dam as the SDF’s local Arab components are not independently combat capable, though a local component of the SDF answerable to the YPG may symbolically hold the dam after its seizure – a strategy previously seen in operations to seize the Tishreen Dam in late December 2015. The YPG will nonetheless require support from U.S. SOF to seize the dam. The composition of the force that takes Syria’s largest dam will have major implications for the power dynamics in Eastern Syria in the long-term and can exacerbate underlying grievances about expanding Kurdish influence at the hands of the U.S.-led coalition. ISIS is meanwhile mounting a calculated defense of ar-Raqqah City and neighboring Tabqah. ISIS likely intends to cede rural terrain in the ar-Raqqah countryside, which lacks natural defense, in order to draw the SDF into dense urban terrain in Tabqah and ar-Raqqah City, where the group can maximize its advantages in irregular warfare including improvised explosive devices and suicide attackers. The U.S.-led coalition has reportedly conducted only limited strikes against the Tabqah Dam in order to minimize damage to the structure. Combat in dense urban terrain in Tabqah will risk the exhaustion of local forces before operations in ar-Raqqah City even begin. Moreover, intelligence officials estimate that there could be up to 10,000 ISIS fighters in ar-Raqqah City by the time the fight reaches the city limits. ISIS's defense of Mosul in Iraq highlights how high the jihadist group can raise the costs for multi-faceted coalitions by exploiting seams between rival factions within a coalition and mounting a robust defense of major urban centers under its control. The nascent U.S. anti-ISIS strategy for ar-Raqqah City remains susceptible to potential spoilers seeking to disrupt the U.S.’s alliance with the majority-Kurdish Syrian Democratic Forces (SDF) and NATO member state Turkey. Turkey and the SDF will continue to position themselves to shape the formation of U.S. anti-ISIS strategy in and the future of northern Syria through kinetic and political means. The U.S. must therefore consider slowing the SDF advance on ar-Raqqah or risk bringing about an Arab-Kurd war on the sidelines of Operation Euphrates Wrath. 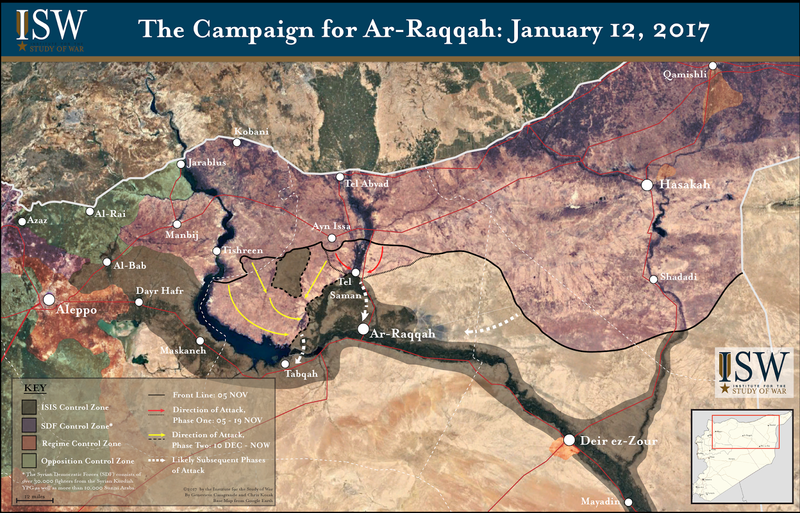 The battle for ar-Raqqah presents opportunities beyond the anti-ISIS fight, although victory in ar-Raqqah and the establishment of stable governance outside the influence of Salafi-jihadist groups will be measured in years, not months. The U.S. must not sacrifice long term stability for a quick victory against ISIS in ar-Raqqah City.